Simplicity is beauty. For a lady in her 40s, I guess it's time to make things simple. Cake with plain white fondant cover and pink roses with butterflies would be good enough to make her birthday a memorable one. These roses were handcrafted with gumpaste, the butterflies were cut out and painted with pokka dots. 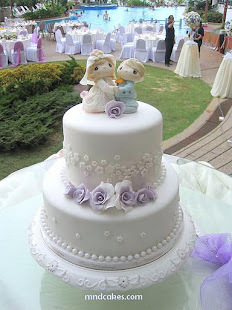 Edible silver beads were added to give an elegant touch to the cake. ﻿At the side, I added 8 pieces of fondant plates, embossed with flowers and dusted with shiny edible pink and white pearl powder. Not forgeting a birthday message to be conveyed from the giver, a young lady who was still studying at a college in Penang.